Big Cinema has a long tradition of playing into its own history to show us tinted versions of how the sausage was made. The creative struggle is real in the movie business, and as these films portray, it always has been. Let's take a look at a few of the greats. The award-winning film Argo (2012) is a fun flick. Billed as an historical drama, it's a little more Hollywood than the true story it is based on. Maybe a lot more. But that's why audiences liked it. Fans and filmmakers love lore and legend. Cinema strives to celebrate itself (that's what the Oscars were created to do) and, as the ultimate storytelling medium, movies about the mad minds who make movies are usually compelling. Of course, Argo is the antithesis of that. It's a movie about not making a movie. This CIA agent and a couple of Hollywood insiders design a production with a more humanitarian goal than completing a film to make art or money: they're trying to rescue hostages. It's also basically a costume drama period piece (set in 1979) and it's loosely adapted from an article about a section of a memoir. So there's something for everyone, regardless of your opinions about Ben Affleck. The previous year's Oscar winner for best picture is more of a direct nod to films and filmmakers of an earlier era. The Artist (2011) tells the story of a silent film star displaced by a new technology – sound. It's notable that as viewers we are immersed in the world of the protagonist because the movie is presented in the style of the movies he makes: it's black and white and silent (for the most part). Personally, I think it's a bit of a cheat to make an old-timey picture with modern production techniques, but maybe that's just me. The soundtrack is composed almost exclusively of an overflowing orchestral score that leads the mood just as well as the exaggerated facial expressions required for silent films. For my money, Singin' in the Rain (1952) is a better movie about the transition from silent films to talkies. It's nearly ancient to our eyes, but Singin' was also a period piece, depicting the late 1920s from the early 1950s. Although Singin' in the Rain is from the opposite point of view as The Artist, the focus is similarly on performance, in this case song and dance. What they have in common is that their respective art forms are presented in their native language and with splendor. However, where Singin' is honest to its contemporary time as one of the ultimate fifties musicals, The Artist is more like a pantomime. It's really just a metaphor about the theme of technology rendering one's talents obsolete. The Coen Brothers' Barton Fink (1991) offers a genuine portrayal of something more difficult: a writer who works outside of the written word. The titular character is a playwright hired by a Hollywood studio to write a wrestling picture. The Coens wrote the part specifically for John Turturro, who plays BF with a rough blend of anxiety and frustration. According to legend, the Coens wrote the screenplay in three weeks as a break from working on Miller's Crossing. Maybe they were struggling with some of the same issues troubling Barton: the challenge between attempting to make an entertaining feature but also one that challenges the present cultural status quo. Creativity caged by laborious constraints. Barton Fink is set in 1941, when Hollywood was at its most dominant, an unrivaled cultural juggernaut full of corruption and endless money. The depression was ending and USA involvement in WWII was about to begin. Barton Fink wants to capture the conundrum of the common man, but he is not the common man. He is an intellectual elite who doesn't even really like common men. Film noir was burgeoning during this time, a new creative style of cinematic expression that would have been an appropriate form for Barton Fink. Unfortunately, he was tasked to come up with lighter fare, and besides, screenwriting was not considered the highest type of literary art at the moment. As portrayed by Barton's counterpart, W.P. Mayhew, novelists went to Hollywood to sell out and drink themselves to death. Barton Fink accurately conveys the smallness and immediacy of being a writer in the heart of the analog era, while also showcasing 1940s Hollywood as the fatally fantastic alternate reality it tends to be. But The Aviator (2004) is both an epic and a valentine to the time, a dichotomy that fits its flawed but brilliant hero perfectly. Based on the life of Howard Hughes, the film chronicles his career as an investor, aviation pioneer, filmmaker, and businessman. It also presents a gloriously tragic and dysfunctional existence with compassion and creativity. Incomparable cinephile Martin Scorsese designed the movie to look like films of its era with lighting techniques of the time and now-obsolete color processing. 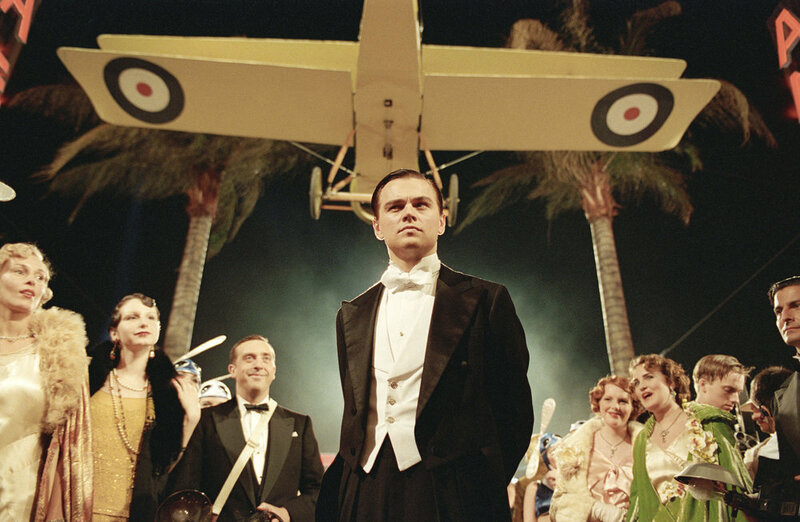 Paired with perfectly detailed sets, wardrobe, and styling, everything about The Aviator engages viewers with its subject. And while Hughes was a problematic figure, so too is this biopic primarily because it's too long. It could also be a lot more sensational, what with his multitude of affairs with starlets and debilitating OCD, expressed more desperately in the thirty years that follow the end of the movie. But DiCaprio is excellent as he almost visibly grows up on screen here. Catch Me If You Can came before The Aviator, arguably his last childish role. Everything else is adult and complex. Daniel Day-Lewis gave us in Daniel Plainview a man so singularly driven to success that its rewards are simply byproducts of his efforts. DiCaprio's Howard Hughes is more nuanced. His drive has no real competition other than the natural world, which unfortunately includes the rest of humanity. Hollywood is a hard place to live and breathe. It's even harder to make a living making movies. And it's natural to glorify the past, which is why movies about Hollywood are usually strong. The people who make them really love what they're doing. Hollywood loves Hollywood.